This article describes what to check if the furnace or forced air blower fan does not stop when you expect it to do so. These same diagnostics also aid in air conditioning blower assembly diagnosis when an A/C blower continues running. We explain what switches or controls may be set improperly or what else, such as a shorted wire, can cause continuous HVAC fan operation. These diagnostic steps are for an air handler, blower, or furnace fan that just won't quit running. at HEAT WON'T TURN OFF. First, confirm that the room thermostat is not calling for heating or cooling. In the heating season, just set the thermostat(s) to the lowest setting and confirm that room temperature is above that point. In the cooling season do the opposite - set the thermostat to its highest setting and confirm that room temperature is below that point. You have told the thermostat to turn off the HVAC equipment. If the equipment was running give it three to four minutes to shut down. 1. At the room thermostat: the FAN-AUTO-OFF or FAN ON/OFF switch on the room thermostat should be checked. The fan control should be set to AUTO. You can try turning the switch to OFF too. Other snafus such as a shorted thermostat wire can also cause the A/C or warm air furnace fan to run continuously. Those problems are explained at THERMOSTAT WON'T TURN OFF. 2. At the furnace or air conditioner air handler or blower unit: the fan limit switch may include a switch that manually keeps the fan running. Some models of Fan Limit Controls such as the Honeywell L4046B229& Universal Fan and Limit Controler, in particular the Honeywell L4064B,W, and R models have a manual fan switch that overrides the fan control to keep the fan running continuously. The white knob and white arrow in our photo point to this manual fan switch. Take a look at the fan limit control switch. Before pulling the cover off of the switch, just see if the switch includes a control such as the white push-pull switch like the white device shown at the lower left in our photo. Depending on the position of this switch (pushed-in or pulled out) the fan may be on manual override - causing the fan motor to run continuously. Usually: "Push-in" position on this (Honeywell) fan limit switch is for continuous fan operation and "Pull out" position is for automatic fan operation. There are some reasons (explained at BLOWER FAN CONTINUOUS OPERATION) to leave the blower fan on continuously for long periods, such as to use an air filtering system to improve indoor air quality. And in some buildings we may run the blower continuously for more even or better conditioned (heated or cooled) air distribution. out FAN LIMIT SWITCH INSTALLATION & WIRING. see THERMOSTAT WON'T TURN OFF. at BLOWER FAN CONTINUOUS OPERATION. This article series answers most questions about central heating system troubleshooting, inspection, diagnosis, and repairs. We describe how to inspect, troubleshoot and repair heating and air conditioning systems to inform home owners, buyers, and home inspectors of common heating system defects. Contact us to suggest text changes and additions and, if you wish, to receive online listing and credit for that contribution. My fan keeps running with no heat on furnace. What can I do? Check the thermostat settings to be sure that you are calling for heat (set-temperature is above room temperature). Check that the thermostat FAN switch is set to AUTO not to ON. Check that the manual FAN ON switch at the fan limit switch in the furnace or air handler is not in manual ON position. See FAN LIMIT SWITCH for details. Check the furnace primary controller to see if the "reset" button on the control (or on the burner motor) has popped out - you can try pressing the switch in ONCE but don't keep pressing it as doing so is unsafe. For gas fired furnaces see SPILL SWITCH, FLUE GAS DETECTOR; other defects such as a bad thermocouple can keep the gas burner from igniting or burning. Check for voltage at the oil burner primary control. This is a simple test to see that power is actually being delivered to the oil burner control. You can use a neon tester, a VOM, DMM, or a voltage detector stick. Check for a bad primary control: If there is voltage to the primary control, no reset buttons are popped, and the thermostat is calling for heat (check that right at the primary control thermostat wires) then I suspect a bad primary control unit itself. At that point your heating service tech will perform her own tests and then if needed repair wiring or replace the furnace control. Gas heat: see the gas furnace controls cited above at step 4. If the furnace tries to start but cannot keep running then there is a different problem such as no fuel or an unsafe condition. 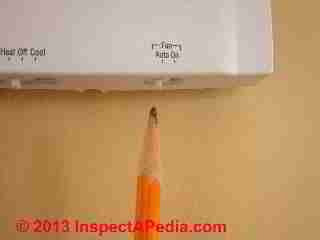 Continue reading at FAN WONT STOP - THERMOSTAT SWITCH, or select a topic from closely-related articles below, or see our complete INDEX to RELATED ARTICLES below. FURNACE FAN WONT STOP at InspectApedia.com - online encyclopedia of building & environmental inspection, testing, diagnosis, repair, & problem prevention advice.